← Why is the West so determined to take Russia apart? Is this really why the regular California firestorms were engineered? WASHINGTON — California officials have been pushing for more natural water storage since the last large-scale facility was built in 1979. Now they’re finally going to get it, thanks to political pressure, President Donald Trump and some congressional creativity. The House approved several provisions Thursday that help fund water storage projects. The Senate is expected to concur shortly, and Trump is expected to sign the legislation into law next week. Republican Rep. Jeff Denham and Democrat Rep. Jim Costa have been pushing for additional water storage for the state for years in constantly-at-risk-of-drought California. Since 1979, California’s population has grown 70 percent. Trump has been pushing infrastructure project funding since he came into office and spoken publicly in support of more water for the Central Valley — though some of his statements have showed a misunderstanding of the issue, such as when a Tweet suggested lack of water was to blame for wildfires in California. This is also the year Republicans are most worried about defending Denham’s seat. Democratic presidential nominee Hillary Clinton won his district by three points in 2016 and the GOP frets about a blue wave taking the House in 2018. But water — and getting more of it — is the most important issue in the district. If Denham can get some concrete wins on the water issue before November, he has a much better chance of keeping his seat. Denham denied politics has anything to do with the water storage action, lamenting in an interview with McClatchy that “politics is the excuse for everything I do every other year. “This is Congress, I think most people would say getting this done in eight years is expedited,” Denham said. He and Costa instead credit some common sense thinking on the issue, creating a new way of funding water storage instead of relying on the same federal process. Sal Russo, a Republican political strategist based in Sacramento, said Trump probably deserved more credit than the political atmosphere. Denham’s proposal allows local irrigation districts to apply for low-interest federal loans from the Environmental Protection Agency to build new reservoirs, below ground storage projects, recycling and desalination projects. Those are desperately needed in parts of California to capture rains and runoff from the mountains so water can be stored and used in drier seasons and in years of drought. Theoretically, the irrigation districts could eventually easily repay low-interest loans through control of the new water sources, and having a larger supply of water would drive down demand and cost of fresh water throughout the state. Several water storage projects in the state have already been authorized by legislation and are awaiting funding. Costa’s proposal would allow dams and other water facilities regulated by the Army Corps of Engineers but owned by local entities to use non-federal funds. Currently, if reports indicate more water will flow to an area in a certain season, local entities that own dams cannot provide money to the Army Corps to prepare more storage, for example. Those have to be federal funds, even though the dams are not federally owned. And water storage tends to fall low on a long list of federal priorities. Interested parties in the San Joaquin Valley and in Washington, D.C. aren’t so concerned with assigning praise to politics or the president, saying they’re just glad it’s finally happening. 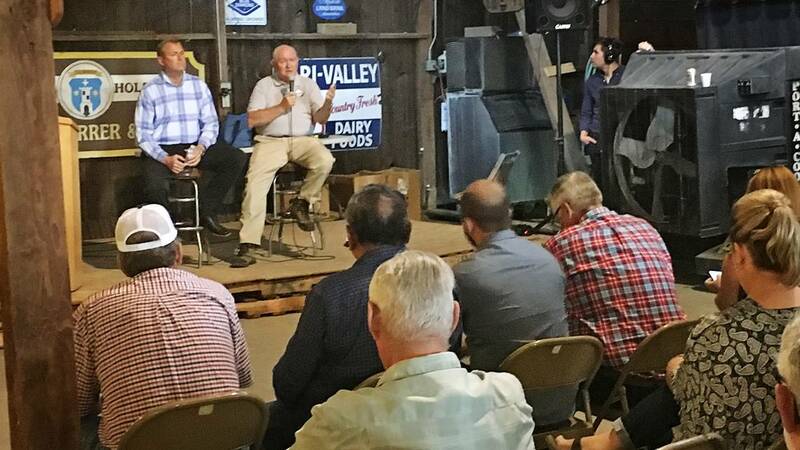 “Some people may think (Denham) is pandering to the district, but he’s been consistent as long as I’ve known him,” said Tom Orvis, governmental affairs Director for the Stanislaus County Farm Bureau, one of the largest in California. “Timing sometimes has to do with politics, but this is good policy and we’re proud of it,” he added.